In 1970, there were less environmental awareness and friendly ways of living. However, that does not mean Earth Day cannot be celebrated. Here are three local Birmingham events to get the family out and enjoying what the earth has to offer. Earth Day at the Gardens – Birmingham Botanical Gardens | April 21 | 11 a.m. – 3 p.m. Celebrating all of the green spaces in Birmingham and Earth Day, join the Botanical Gardens for their free day of fun. Throughout the day, learn about how to protect local green spaces and how to best enjoy them. Get more info here. Earth Day Celebration – Red Mountain Park and Cahaba Cycles | April 22 | 10 a.m. – 2 p.m. Multiple free guided History Hikes. One family friendly that is a little over 2 miles and another, more advanced 5-mile hike. They will have Urban Pops, Dreamland BBQ and Cahaba Cycles set up. Remy’s Dog Park will also be open. Get more info here. 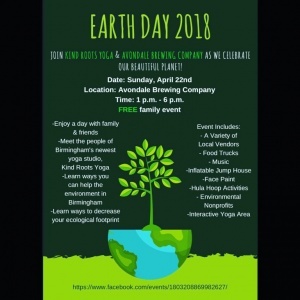 Earth Day 2018 – Avondale Brewing Company and Kind Roots Yoga | April 22 | 1 – 6 p.m. This is a free family fun event that has local venders, food trucks, music and kid’s activities while learning about caring for the Earth. They will have educational involvement from organizations promoting the community’s effort to reduce their carbon footprint. Get more info here.